I am so honored to introduce to you my friend Rebecca Lynn. Our paths have been divinely crossed in the Compel community and I can not say enough about what a blessing she has been to me over the last few months. I know you will love this story from her just as I do! Welcome Rebecca! I have a confession to make. I used to be a superhero. It all started ten years ago, with the birth of our son – Jacob. That’s when I put on my red cape for the very first time. When I became a mom, my expectations were set fairly high. Planet Krypton, to be exact. And if you understand that reference, there’s a good chance you also have a little boy. Basically, I was going to conquer it all: “natural” childbirth – effortless breastfeeding – and, of course, losing all the “baby” weight immediately. (Sigh) Silly superhero expectations. The reality was toxemia and an emergency C-section, a preemie who didn’t like breastfeeding, and pregnancy weight which did come off … about a year later … right around the time we discovered Baby #2 was on her way. Abigail blessed me with a much easier pregnancy. Thank God! But when she was around six months old, I developed “mommy blues” – and she developed an “Abby-tude,” as we lovingly call it. And slowly, I found myself reaching for that red cape more and more. Piles of laundry mocked me. Grey hairs simply refused to dye – or die. And the constant barrage of “Mom! Mom! MOM! !” tested the limits of my superpowers. But I was Superwoman! The realities of parenting did not deter my determination. My kids were my world. Their happiness equaled my contentment. No amount of dirty clothes, grey hairs, constant demands – or even Abby-tudes – could lessen my love for them! Yes, I enjoyed being their superhero. It’s nice believing my kids look up to me. I want to have every answer they’ll need in life. And if danger approaches, I’ll just throw on my cape and virtually incinerate every would-be villain with my laser-beam eyes. Well … in my virtual reality, that is. In reality, superheroes don’t exist. Although, when I put my contact lenses on in the morning, it does feel like I’ve suddenly acquired superhero vision! But I digress…. The reality is, I want to be their superhero. Most days, I’d simply settle for being their side-kick. I want to be a good mom – a great mom. I think every mom does. But I’m not a superhero. I’m human – just like my kids. I will mess up, make mistakes, take wrong turns and fail miserably. The harsh reality is sometimes I will even be a bad mom. I know, because I have been – many times. But I was never supposed to be their “everything.” I was only supposed to lead them to Him. I need to realize the One who entrusted these two beautiful blessings to me, is also greater than me. He sees the path ahead before I do. He sees every obstacle before I do. He sits on the throne above every authority in Heaven and on earth – even my superhero one. His name is the Good Shepherd –Lord of Hosts – and King of Kings. If you are on a first-name basis with Him – you may simply call him Jesus. 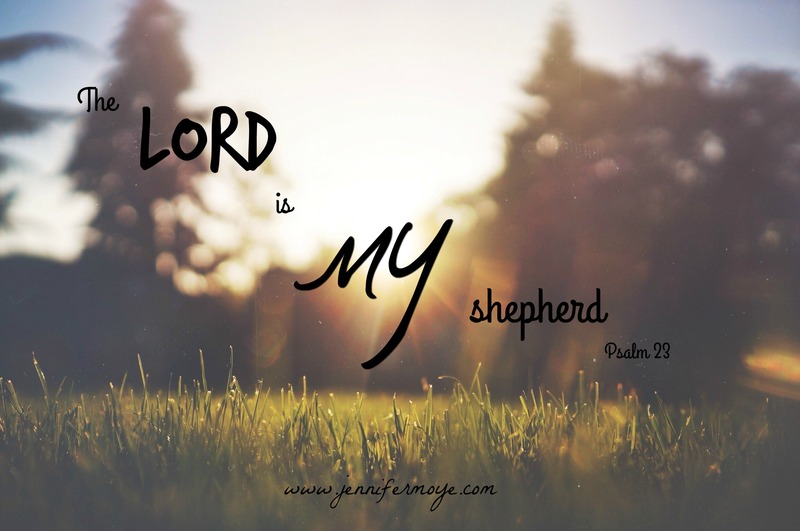 I was reading Psalm 23 recently, and was struck by the absolute peace that David had – right in the middle of one of the biggest storms of his life. David was a shepherd ~ a warrior ~ a king! He had the gentleness to herd sheep, and yet he slayed Goliath with a single stone. David was a natural born leader – beloved by almost everyone – entrusted with ruling over an entire nation. In fact, as a king he probably did have a real red cape! If anyone deserved superhero-status in life, it was King David! But David also knew there was One greater than himself. David knew he wasn’t alone in those pastures. He trusted his Good Shepherd to lead the way. He knew he wasn’t walking onto the battlefield protected by the might of a stone and a sling. His faith was in the Lord of Heavenly Hosts. And David knew the kingdom of Israel wasn’t his to rule alone. He surrendered authority to the King of Kings. David did not try to be a superhero. So as our children face valleys, giants, and heavy burdens – let us learn from David. The shepherd boy who needed his Shepherd. The mighty warrior who needed his Lord. The king who needed his King. David was strong enough to admit his weaknesses, and to rely on God’s strength and abilities. The more I give God authority over my life, the easier it is to let Him also reign over the lives of my children. Like David, I need to let them depend on the One who is truly in control ~ God. After all, He blessed me with them, and they belong to Him! Realizing that truth lifts such a heavy burden from my shoulders! I don’t need to worry. I don’t need all the answers. I don’t need to pretend to be someone I’m not. Even if I completely mess things up, God’s got this! And here’s another truth: God won’t let me completely mess things up! God blessed me with these children, and He knew I was the perfect Mom for them. He forgives me when I confess my mess-ups. He teaches me when I seek His wisdom. He will use everything for our good. His perfect love for us allows me to find rest! If my children choose a wayward path, God will be there to guide them back. If they come up against overwhelming obstacles, God will fight for them. And if they don’t have the answers they need in life, God’s authority will never fail them. The truth is: Just like David and just like me – my kids need their Shepherd, their Lord, and their King! They need to understand that superheroes are not real – but God is! So as difficult as it is, I am hanging up my cape. No more Superwoman in this house. There’s only room for one ruler. We are on a first-name basis. **When I wrote this, my son Jacob was going through a pretty big medical scare. He’d been running 105 fevers for a week straight, and doctors were concerned he might have a rare childhood disease. On the day we received the sudden orders to check Jacob into our local children’s hospital for evaluation and more tests, I was frantically packing a suitcase and came across this red Superman cape. To fully understand the significance of that moment, I should explain that this cape hasn’t been worn by my son in probably five years – and it wasn’t even on my mind as I wrote this. It sits folded and tucked away – high up on a shelf in a closet. My daughter had been rummaging through that closet days before – but I never saw this cape lying on the floor, or anywhere for that matter. But in that heart-stopping moment, with this blog post fresh in my mind, it’s as if God placed it right at my feet. In fact, it was the only thing lying there in the hallway – just perfectly placed for my eyes only. I nearly burst into tears – and yet I couldn’t help but rejoice! My Shepherd, my Lord, my King was saying “Just hang this one up, Rebecca. I’ve got this!” And He did! We discovered the next day that my son did not have any disease – but a severe case of mycoplasma pneumonia. After several doses of antibiotics, he was completely healed. Thank you, Jesus! Rebecca and her husband have been married for 13 years and have been greatly blessed with two children. Rebecca is a member of the Proverbs 31 training program, COMPEL, where she is developing and working to establish a platform for her writing. Rebecca has also served in prison ministry, where she used her writing to minister to prisoners who were seeking a better relationship with the Lord. Rebecca’s passion for God and love for others is what motivates her writing. She comes from a long line of passionate writers, authors, ministers, and theologians. Her 5th great grandfather came to the Americas in the 1700s and was instrumental in establishing Christian churches throughout Pennsylvania. He dedicated much of his life to studying, teaching, and preaching the Word of God – and was a well-respected reverend, missionary and theologian. He traveled on horseback as far as the Carolinas and Georgia, teaching and preaching God’s word from the Hebrew, Greek and English translations. Today, Rebecca continues her family’s love for writing and sharing the gospel, and she prays social media will become the means of travel for her passionate voice. You can reach Rebecca by contacting her via email at rldevotions@gmail.com. Her Facebook and blog websites (RebeccaLynnDevotions) will also be published very soon! You bless me, sweet friend! Life is definitely a journey, isn’t it? I’m so thankful for the moments when God is so present – so loud and clear – and pressing Himself upon our hearts. We are better moms, wives, daughters, friends and followers of Christ when we keep our hearts searching for Him, and seeing life through His will. Thank you for sharing my Superhero story. I pray it will be a first of many more that God will help me write! The joy is all mine!